Iori Humphreys has recently been selected to run for Wales in the International Cross Country race in Dublin, Ireland. Congratulations and good luck Iori, this is an amazing achievement. Many congratulations to the following pupils for their superb performances, whilst representing our school and Pembrokeshire, in the all Wales Urdd Gobaith Cymru swimming finals, in the National Pool Cardiff. Caera Lewis (Breast stroke yrs 7/8) : 2nd. I.M. 4th. Lauren Omnet (Breast stroke yrs 9/10): 4th. Freestyle 6th. Hannah Greenwood (Backstroke yrs 9/10): 4th. All at Ysgol Harri Tudur are extremely proud of their great achievements. Da iawn chi! 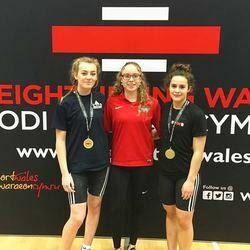 Mena Williams (Year 10) travelled to Bangor on 8 December 2018 to compete in the Welsh Age Groups Weightlifting Competition. She came away with a gold medal in the U15s for her weight category. This is an amazing achievement. Congratulations, Mena. Mena is competing in a British competition on Sunday 13 January 2019. We wish her good luck and we look forward to hearing more about her weightlifting successes. 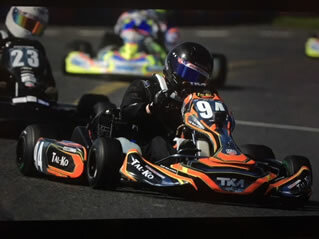 Congratulations to Ben Watson who competed in the British Karting Championships and achieved great success. He is now seeded 9th Junior TKM driver in the UK. Ben will receive his award at the Autosport International Show at the NEC on Saturday 12th January 2019. Ben has given amazing commitment to his racing this year and is determined to improve again in his 2019 campaign. What a brilliant sporting achievement. Well done, Ben! Many congratulations to our fantastic Kids' Lit Quiz teams and their supporters who did themselves proud at the Wales heat at Howell's School in Cardiff on 21st November 2018. Very creditable performances from both teams with fantastic scores, especially since we haven't had the usual team preparation this year we would normally have had. Nyah Elliott in the reserve team wn herself a £5 book token in an audience hotspot question, and Grace Taylor won a team hotspot question. We are very proud of you all! A massive thank you to Ms A Rees, Teacher of English, for giving up her time to take the teams to Cardiff! Congratulations to Holly Callen who swam the County Championship on the 27th and 28th October 2018. Holly swam six races and gained personal bests in all six. She also gained a gold medal in the 100m breaststroke and silver medals in the 50m breaststroke and the 200m breaststroke. What a brilliant sporting achievement. Well done, Holly! Lowri Hart has qualified to compete in the Victor Welsh Senior International at the end of November 2018 with over 200 players from 28 countries competing. Lowri is the only Welsh Junior Player who has qualified. A brilliant achievement. Congratulations and good luck, Lowri! for all of your amazing performances. Congratulations to all the pupils (listed below) who took part in the Official Opening Ceremony Show Choir performance of Karl Jenkins' Adiemus on Thursday 8th November 2018. You were absolutely superb. Mrs Kite says 10/10 !!! The following pupils will be receiving the Headteacher's Award for their group performance at the Shakespeare for Schools Festival on Thursday November 8th 2018. Congratulations to them all, we are very proud of you! Many congratulations to Cory Baker in Year 11 who represented Team GB in the Scooter Championships in Corby on the weekend of 10-11 November 2018. What a brilliant sporting achievement. 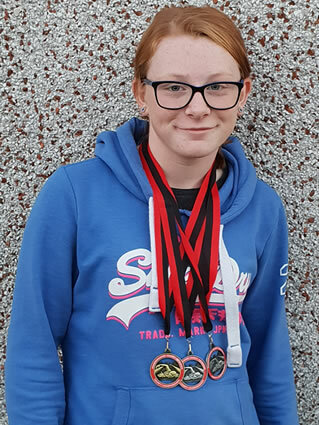 Many congratulations to Sam Hodgson in Year 11 who represented Wales in the British Surf Kayak Championships in Thurso in October 2018. What a brilliant sporting achievement. Well done, Sam! Many congratulations to Rhys Daley in Year 7 who has received a call up to the Cricket Wales Welsh Development Squad. Another brilliant sporting achievement. Well done, Rhys! 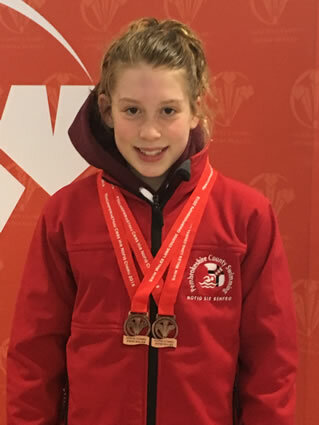 Many congratulations to Caera Lewis, who has been one of only four selected for the Swim Wales National Squad for the 2018-2019 season. This is an absolutely fantastic achievement. The Squad also includes many senior athletes who have participated in the Olympics and Commonwealth Games. Caera is currently training seven times a week. We are very proud of you, Caera, and look forward to hearing more about your swimming successes!